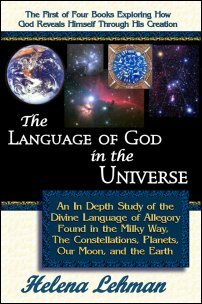 Click the cover to learn more about “The Language of God in the Universe,” A 430-page, illustrated book showing the symbolic and prophetic meanings hidden in every aspect of God’s Creation, with a special emphasis on the biblical symbology connected to the Gospel in the Stars. 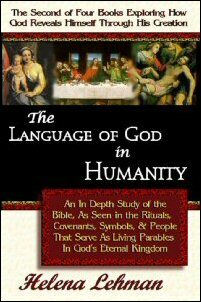 Click the cover to learn more about “The Language of God in Humanity”- A 675-page book showing the meaning of Old Testament Feasts, Rituals, Symbols, and Architecture, the New Testament Parables and Symbolic Rites of passage such as Baptism and Communion, and their Connection to the Gospel in the Stars. Click the cover to learn more about “The Language of God in History” - An 800-page book exploring the Pre Flood world of the Sethites, Archeoastronomy, the causes and affects of the Great Flood, biblical World History, and the purpose and heritage of God’s promises to Abraham and Israel. 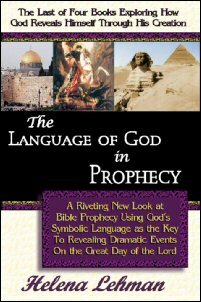 Click the cover to learn more about “The Language of God in Prophecy” - An 800-page book that exhaustively explores End Time Eschatology and Bible Prophecy, with text & illustrations showing the meaning the Gospel in the Stars, the Great Pyramid and the Great Sphinx in their proper biblical and prophetic context. 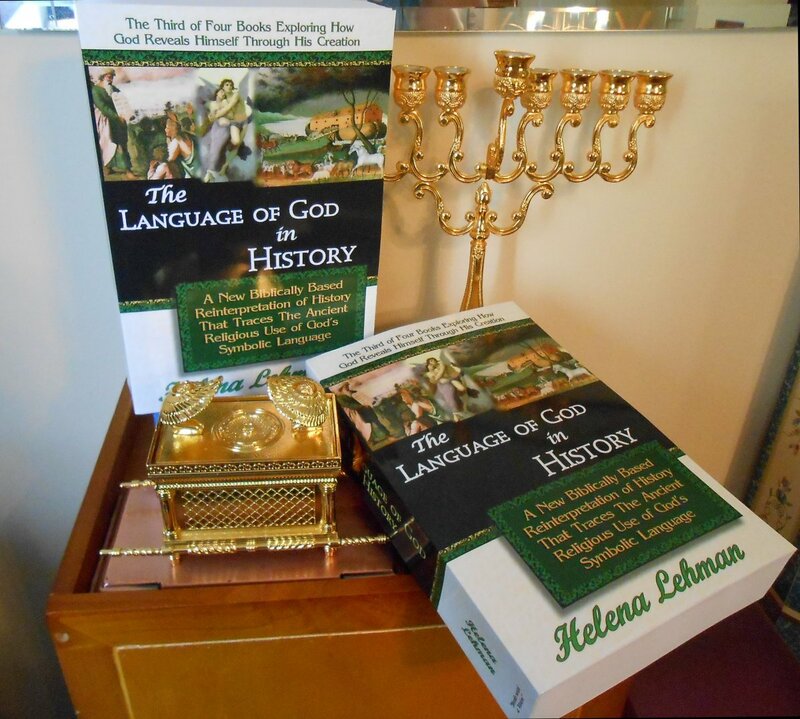 This is the 7th Edition of Book Three in the Language of God Book Series : “The Language of God in History - A New Biblically Based Reinterpretation of History That Traces The Ancient Religious Use of God’s Symbolic Language”, ISBN: 0-9759131-2-3. All Paperback Books ordered from the POEM Ministry Web Site come autographed by Author and Minister Helena Lehman and include a Ministry Bookmark. In addition, a Ministry Ballpoint Pen is included as a gift with each order from this web site, or using the mail-in order form. You May Also CLICK HERE To Go To the Drop Down Menus Below to Purchase THE DIGITAL DOWNLOAD OF THIS BOOK, or to Purchase Two or More Language of God Series Paperbacks, and/or Digital PDF Books on CD. Scroll Down a bit further from there to find the links to order the Kindle and Paperback Book online from Amazon.com. It was the 1st Place winner in the Religion and Spirituality category in the Rebecca’s Reads Spring 2010 Written Art Awards. The book also received a very favorable review from one of the contest judges named Kam Aures, which can be accessed in PDF format BY CLICKING HERE. Two more favorable independent reader reviews have also been linked to toward the bottom of this web page, just above the PDF book excerpts list. The 7th Edition of this book reinterprets history and archeology within a biblical framework and refutes and exposes the atheistic humanism behind modern archeological, scientific, and historical viewpoints. Next, using facts found in the Bible, Josephus’ “Antiquities of the Jews”, the Ethiopian Book of Enoch, the Book of the Secrets of Enoch, the Book of Jasher, the Book of Jubilees, and “The Legends of the Jews” compilation taken from the Midrash, the teachings of Enoch before the Flood, the scourge of the Nephilim on humanity, the possible causes of the Great Flood, the migrations of Noah and his sons after the Flood, and the swift Post-Flood devolution of mankind. The Post-Flood rebellion against God found in Paganism, Astrology, Sorcery, and Humanism are also explored - as Noah and Shem’s righteous witness were forgotten, and Yahweh’s truths were perverted just as they had been prior to the Flood. The book also takes a close look at the reasons behind the ancient war between Noah and Nimrod, and the deep roots of the blood feud between the Jews and Arabs over the Promised Land. This exploration of history thoroughly explores the Pre-Flood world of Enoch and the Sethite Astronomy and Gospel in the Stars that Enoch developed into a profound spiritual discipline that led the sages of past ages to create the pyramids at Dahshur, Giza, and Teotihuacan, the statues on Easter Island, the monument at Stonehenge, the Angkor Temple complex and the so-called Aztec Calendar Stone found in Mexico as spiritually significant allegorical messages in stone that are tied to the End Time Signs in the Heavens that Yahshua spoke of. The book also explores the spiritual and scientific disciplines that were behind the journey of the Magi or Wise Men to Bethlehem to worship Yahshua as the Messiah that was prophesied about in the stars before the world was even created. Finally, the rise and fall of ancient Israel, the facts behind their migrations in the Diaspora, the re-immergence of Israel in modern times and its ties to the United States in light of End Time prophecies, the secret meanings and dire implications behind the ideologies expressed in the 2008 US Presidential Race, the history and ultimate destiny of the Kingdom of Israel, and the amazing Signs in the Heavens connected to Orion, Draco, Taurus and Scorpio that are tied to the Tribulation and Second Coming of Christ are explored in preparation for the exhaustive study of biblical prophecy and the Signs in the Heavens in the final book of this series. This 6” X 9” Paperback, ISBN # 978-09759131-2-3, has over 770 pages of text and over 30 pages of original Black & White illustrations printed on quality white paper. It also has an extensive bibliography and full index, and is available for purchase from my Ministry Bookstore. How the Nephilim originated with the fallen angels called Watchers who mated with human women and fostered a perverted, hedonistic culture that promoted False Religion, Sorcery and Paganism. Why the Mayan Calendar of the New World may be connected to Enoch the Sethite, why it foretells the beginning of the end of this carnal world on December 21st 2012, and why it should be heeded as an accurate marker for the release of the Four Horsemen of the Apocalypse, and of the coming of the birth-pain plagues that will be released before the Great Tribulation. The 7th Edition of “The Language of God in History” gives a brilliant and clear defense of biblical history, and reveals how our ancestors may have creatively designed their religious monuments to reflect the spiritual allegories God wrote into our Universe. It also explores the history of the Kingdom of Israel, and delves into the true nature of dinosaurs and their possible links to the Behemoth, Leviathan, Nephilim and Giants spoken of in the Bible. 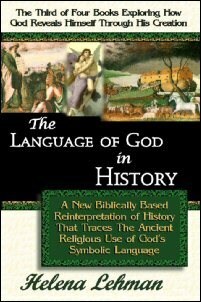 For those who wish to discover history in a way that fully supports the biblical record, “The Language of God in History” does just that. It is the third book in a four book series that explores the many different ways God reveals Himself to us through symbols. Scroll down to find links to some major book excerpts and reviews of this book. If you like what you see and read, you can use the Drop Down Menu above to purchase this book, or the menus toward the end of this page to purchase either the Paperback, Data CD, or E-Book versions of each book in the “Language of God” Book Series individually, or in discounted 4-Book Sets. 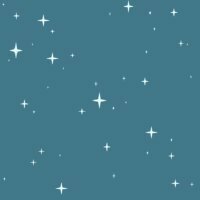 IMPORTANT COPYRIGHT NOTICE: The book excerpts below are part of a book copyrighted in the USA by the Helena Lehman, and permission must be obtained before they can be used in any digital or printed publication. Please Contact Helena by CLICKING HERE to do so. Which Ancient Texts Are the Most Reliable? A Question of Race - Are We All Under Grace? IMPORTANT NOTE: ALL PRICES REFLECT A 25 to 35 Percent Discount Off Retail Prices, and all of the Books are BIG, ranging from 450 pages to 800 pages long (or 2 to 4 times the size of an average book! ): Use the DROP-DOWN MENU to Select the Desired Book(s), Cd(s), or 4 Book Package. All Paperback Books ordered from the POEM Ministry Web Site come autographed by Author and Minister Helena Lehman and include a Ministry Bookmark. In addition, a Ministry Ballpoint Pen is included as a gift with each order from this web site, or using the mail-in order form. IMPORTANT NOTE: These Downloadable E-Books are now nearly identical in Price to the Kindle Books Versions, but WITH NO LOSS OF FORMATTING, unlike the Kindle versions. Use the DROP-DOWN MENU to Select the Desired E-Book(s). In order to access the PDF E-books, you will need to enter the User Name and Password that will be sent to you by Author Helena Lehman of the Pillar of Enoch Ministry after purchasing the books. After ordering, you will receive an e-mail from POEM with the access codes for the books you ordered within 48 hours of purchase. PDF format books on your PC or I-Pad. Download the FREE Adobe Reader by CLICKING HERE.